This regular column contains information about the latest updates to ArcGIS Online, including new features and capabilities, basemap updates, and content contributed by the global user community through the Community Maps Program. This issue focuses on the March release of ArcGIS Online, which includes many improvements for working with maps, new ready-to-use application templates, and updates to existing applications. 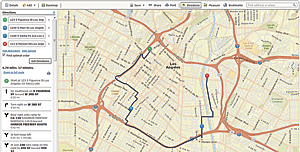 Add directions and optimized routes with multiple stops to your map. You can now get directions in the map viewer. These printable directions include optimized multistop routes and the ability to reverse directions with a button click. Also new are Esri map layers. Search Esri map layers to find selected ArcGIS for Server services published by Esri. This includes economic, demographic, and traffic map layers that can be added to maps. Both the Directions button and Esri map layers appear in the map area after signing in with the organizational account. Esri has also added support for three additional layers that can be added to the map: Open Geospatial Consortium, Inc., Web Map Tile Services layers; tile layers; and GeoRSS file layers. And speaking of layers, you now have the ability to change symbols on dynamic layers in ArcGIS 10.1 for Server map services. It is now easier to include multiple shapefiles with your hosted feature service. When publishing a hosted feature service, instead of having to add one shapefile at a time, you can now include multiple shapefiles within a single ZIP file. A new configurable Parcel Viewer template is available for displaying government property tax and assessment information. The Edit template has also been updated to make it easier to use on mobile devices and to edit layers in a web map. The Swipe Tool template has been added to the Web Application template gallery. With this template, you can compare two web maps side by side. Esri Maps for Office has a number of improvements. You can now enrich your spreadsheets with demographic and lifestyle data. For example, clickable infographics on the map tell more about what kind of people live in a certain location. Use Find Nearby to find all the points in one map layer that are within a certain distance of points in another map layer or that fall within a specific region. New configuration options for heat maps and smart clustering give you more control over styling a map, and Esri has added support for Microsoft Office 2013. Capture, update, and report information directly from your Android or Apple device. Updates for the Collector for ArcGIS app include the ability to sign in with your ArcGIS Online organizational account and open maps, search for maps, view more sample maps, and access help directly from the app. And to help you get started more quickly with the Operations Dashboard for ArcGIS app, new tutorials and videos were added. The World Geocoding service has been updated so you can now perform geocoding in China. There is improved geocoding quality for more than 30 countries, including Czech Republic, Denmark, Israel, Liechtenstein, Poland, Slovakia, and Switzerland. Esri has expanded the World Network Analysis services to be available for Japan and added support for driving directions in Lithuanian, Polish, and Portuguese. The closest facility service, which is used to find the nearest location from one or more locations based on travel time or travel distance, now supports the solving of large problems with an asynchronous execution mode. An administrator can now see usage reports for geographic context and demographics. Administrators now have the ability to change the organization's region. Region now determines the units of measurement on the map viewer scale bar, measure tool, and directions tool. Complimentary use of Microsoft Bing Maps with ArcGIS has been phased out. However, you can continue to include Bing Maps in your map viewer basemap gallery by adding a Bing Maps key to the map configuration. A Bing Maps key must be obtained directly from Microsoft. Application developers whose organizations have an ArcGIS Online account can register their application with ArcGIS Online and obtain an application ID. This app ID identifies the application to the platform in the context of both user logins, as well as app logins based on OAuth 2.0, and is also the foundation for distributing apps, accessing billable services, and getting usage reports. You can now share these static data files as items in ArcGIS Online: types now supported are DOC, DOCX, JPEG, PDF, PNG, PPT, PPTX, TIFF, URL, VSD, XLS, and XLSX. Log in with your ArcGIS Online organizational account and add these files to My Content and then share them with others. However, these files are not supported as data layers, so they cannot be added to a web map. The list of available language options continues to expand. Estonian and Latvian are the two latest additions, bringing the total number to 22. The language option chosen determines the user interface and how time, data, and numerical values appear. The regions that are available to choose from now include Egypt and Nicaragua. The region selected for the ArcGIS Online website sets the featured maps on the home page, the content in the gallery, and the default extent of new maps in the map viewer. Regions also now determine the units on the map scale bar, measure tool, and directions tool. The Create Editable Layers in the map viewer is now called Add Map Notes. 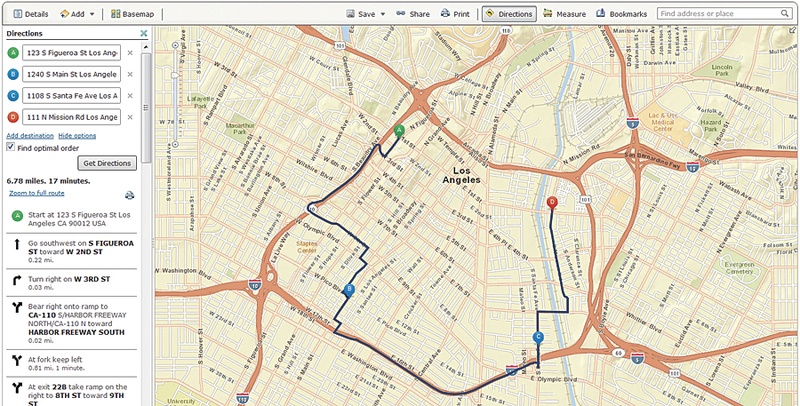 Adding a map notes layer lets you add your own data directly to the web map, and it's also stored in the map. But only the map's author can edit the layer. Since the beginning of the year, Esri has had quite a number of contributions from the Community Maps Program for the World Topographic Map. Below are some of the contributors. To see the entire list, go to esriurl.com/contributors. The Community Maps team has created ArcGIS Explorer Online presentations that showcase the contributors and will post updates regularly. The latest international contributions include content for the country of Romania (1:577,000 to 1:2,000 scale); country of Switzerland (1:9,000 to 1:2,000 scale); state of Baden-Württemberg, Germany (1:144,000 to 1:2,000 scale); and regional district of Thompson-Nicola, British Columbia, Canada (1:9,000 to 1:1,000 scale). The World Street Map was also recently updated with community content for Ghana from 1:577,000 to 1:1,000 scale by Ghana Water Company Limited and Esri's distributor in Ghana, SAMBUS Company Ltd., GIS/GPS Section & Spatial Solution & Services. Coverage for India was updated from 1:288,000 to 1:144,000 scale, and new coverage was added from 1:72,000 to 1:1,000 scale using commercial data from DeLorme and NAVTEQ. The World Imagery Map was updated with community content for the following areas from 1:36,000 to 1:1,000 scale: Cities of Coquitlam, Surrey, Langley, and White Rock, British Columbia, Canada; Sault Ste. Marie and Kenora, Ontario, Canada; Yorkton, Saskatchewan, Canada; Pori, Finland; Wrangell, Alaska, USA; and Town of Newtown, Connecticut, USA. New areas of higher-resolution bathymetric data that covers the Red Sea were provided by the Khaled bin Sultan Living Oceans Foundation. The National Institute of Water and Atmospheric Research in New Zealand provided a 20-meter bathymetric grid over the Hauraki Gulf at 1:4.5M to 1:72K. If your organization doesn't have an ArcGIS Online subscription yet, sign up for a free 30-day trial. You can invite up to five named users to participate in the trial, and you get 200 service credits and these apps as part of your trial: Collector for ArcGIS, Operations Dashboard for ArcGIS, and Esri Maps for Office. Once your trial is over, purchase a subscription and continue to use all the features and services in the same ArcGIS Online subscription account. Sign up for the trial now.